Corvus belli have announced they are working with ancelotti workshop to produce some dropships as well, wonder if they going for larger scale battles in this? To clarify some news from Ficzone: We are now an official partner for Corvus Belli’s “Infinity the Game”, our remit to produce scenery and vehicles (as scenic pieces) for the game; land, sea or air and we will be adjusting our website and some ranges to tie-in with this change over the next few weeks. Scenery, vehicles and buildings will be available retail and wholesale (through Corvus Bellis existing distribution chain) as well as directly from us here at Antenocitis Workshop. “Land, sea or air” means that we have no restrictions about the types of vehicles we can produce, we’re currently concentrating on civilian vehicles with over 22 designs now in development, however we are not precluded from developing military vehicles on the basis that these are scenic pieces and nothing more. This does not mean that vehicles will not play a part in the game though; as with all partners CB work to include scenery from partners into scenarios and the back-story…but CB are not moving the game away from skirmish level, so any military vehicles that we did produce would be cosmetic / scenery, not active gaming pieces. 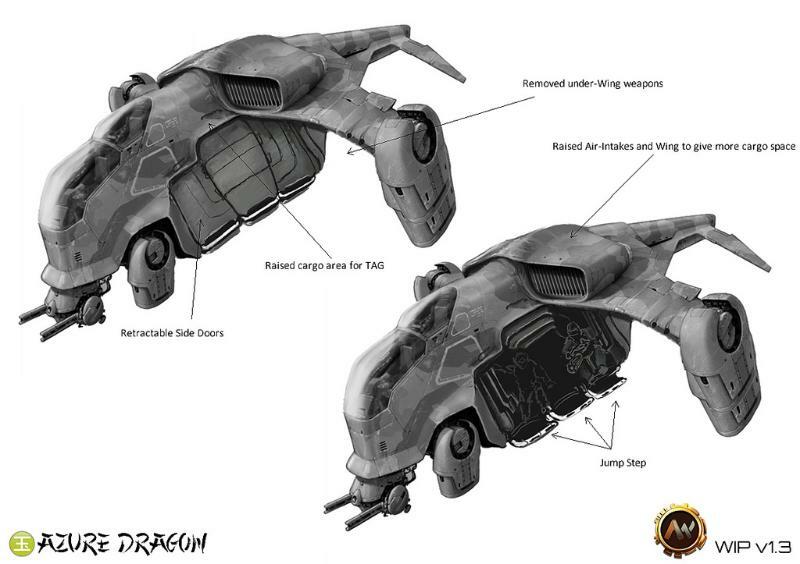 What it does do though is give us a fantastic opportunity to produce products for all the varied factions and environments within the Infinity Universe and, for example we are currently working on the “Azure Dragon” which is a type of YuJing drop-ship. Our scenery and vehicles are being tailored to work with the new silhouette system recently announced at Ficzone, ensuring that the work we do now is “future proofed” and we are, on that subject, in the process of manufacturing new base ranges to fit the three base sizes that will now be standard for the game (25mm, 40mm and 55mm). In addition to this we are busy re-working swathes of the items that were in our “old” Kickstarter plans, which are now being adjusted to fulfil roles in what will be, to all intents and purposes, our Infinity Kickstarter. To give an idea of the level of detail we are intending: where we once had a single set of weapons lockers, we will now have weapons lockers by factional weaponry. Gun-crates will be factionalised, containing different weapons from different factions and our buildings will also have faction orientated elements for those buildings. Our new buildings will be released in a format that allows you to assemble them and play with them right away – fully pre-painted MDF and pre-coloured resin that matches the painted MDF meaning that you don’t need to paint anything on them at all. They will also come with external resin by default, so the doors, windows, vents and other details will come as part of the package, right down to light-gathering rod in their external lights… and all this work being done by our in-game company avatar ‘Phoenix Industries’. Fans of detailing will no doubt also be pleased to know that every building has its own complimentary set of resin for detailing the interiors, covering more than 120 pieces of scenery “Designed for Infinity”. On top of that we are working on three different formats of gaming mat, tailored to match our buildings (and those of other partners), in various materials, modular and single-piece for multiple terrain environments. So, it’s going to be a busy year! We will provide more detail on individual projects as we can, particularly here and via the official Infinity forums once we are set up there. In the meantime we would like to point out that, over the last few months, we’ve been constantly putting off giving detail about our kickstarter asking many of you to “be patient and wait”. We hope that the reasons behind that are now clear; we’ve been working with CB since the end of 2013, so this is not a spontaneous spur-of-the-moment change, however working with a partner like Corvus Belli, who have such a rich and detailed Universe has meant that we have had to revisit certain aspect of our work, drop some, adjust others, and the natural too-and-fro when working with a partner also extends development times. On top of that we now have to potentially cope with a bigger audience than we would otherwise have done, so there has been, and still is, a lot more work to do to ensure that our products, kickstarter and everything else is kept to the high standards that Corvus Belli themselves attain. We’re very confident we can do that and we really hope that you enjoy the products that we will be producing “designed for Infinity”. Sounds like Antenocitis are going to be busy. Nice to see their business growing.